It might sound kind of silly for me to say this, but I’ve typically thought that making a meal of Barbecue Chicken Breasts is a bit of a “splurge” for us. Why? Because hardly ever do I just cook boneless, skinless chicken breasts as our “main dish” without spreading them out within a casserole to make them “stretch”. Even so, this meal costs just a tiny bit more than one dollar per plate. Sweet! I’m so glad to know the price breakdown on this, because we love it. Plus, this meal is super fast and easy to prepare. I’m talking five minutes tops. 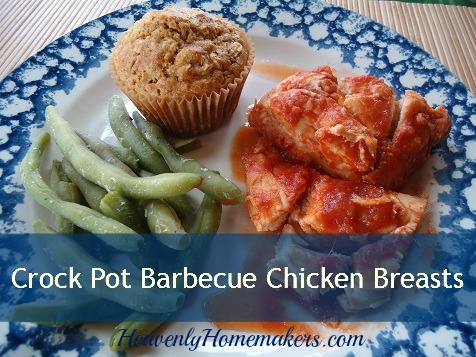 I can quickly throw chicken breasts and homemade barbecue sauce into the crockpot on a Sunday morning before church, or right after lunch on a weekday – and a few hours later, our main dish is ready! Add a veggie or two, and maybe some bread, and your meal is complete. Cut chicken breasts into portion sized pieces. Place in a crock pot, top with barbecue sauce, and cook on low for about four hours or until meat is no longer pink. BONUS: Don't have time for the crock pot? Simply put the chicken and sauce into a saucepan over medium heat on the stove. Cook for 20-30 minutes until cooked through. Serve! Do you often use boneless, skinless chicken breasts for a main dish…or do you typically try to “stretch” them into more meals? I miss chicken breasts! Sadly, we don’t buy them since we started getting our whole, pasteured chickens from a local farm. It’s much cheaper than buying the breasts separately, at least for pastured chicken. However, I did buy some whole chickens, cut up… and I think chicken pieces on the bone will cook just fine in the crock pot with homemade barbeque sauce. :) Thanks for the idea! the bones etc for when I make chicken stock in the freezer. Thanks for the idea Jamie. My farm does sell individual cuts, but I’ve never asked about a volume discount. I’ll have to ask before we make our purchase next year. The farm is 2 hours away, so we only go once a year and really stock up. It’s usually in the Summer that mine does the volume discounts to make room for turkeys and chickens about to be butchered. I think I might cut up a whole chicken for fried chicken this weekend! I just used your Bar B Que sauce on ribs the other day, in the crockpot. I love that recipe. I grew up some Cornish chickens last summer and love sticking them in the pot with the sauce. Whole or half chicken. Makes wonderful leftovers. I had just done a version of this last Sunday for our potluck before bible study. I shredded the chicken breast and served it on whole wheat rolls like pulled pork. Oh, check out zaycon.com. You might be able to set up deliveries in your area for fresh hormone free chicken breast drops. I got 40 lbs for $68. You need a group to order enough for a delivery. It is fresh not frozen so you need to be ready to put it up. I looked up zaycon.com and didn’t find the chicken you were referring to. Would you mind finding the exact link and sending it my way. This is a great price! You can only find them on the website when the sales go “live”. They deliver regionally so it’s generally state based. You can sign up to start receiving their emails and they’ll notify you when they’re available. chicken hormone free, as all poultry will is. Daddy always called them Chicken Chests. I typically use chicken breasts as the main meal. Then two days later I use the leftovers for a casserole of some sort. I can’t wait to try this recipe! Two days ago I threw a whole chicken in a pot and 2 hours later had chicken noodle soup….tonight it is going to be chicken dumplings, and in two days it will be chicken pot pie! 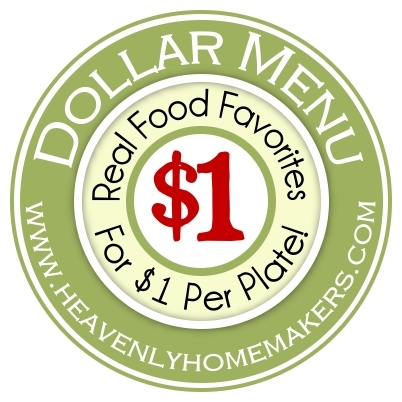 Another great frugal meal idea! Here’s a question for you: have you ever calculated the cost of gardening? My fil was adding up the cost of his last summer and came up with a pretty high total – over $550! This would include seeds and plants, fertilizer, pesticides, fungicide, tilling costs, and canning/freezing costs. I don’t think it counted the electricity for the fence to keep out deer. They do get a lot food from it, but not enough to say that the green beans are almost free. I just wondered if all gardens cost this much or if there are cheaper/better ways to grow your own food. excellent reply–way to go no pestisides and fungicles!! !compost manure from famers…we give it away by the truckload!!! Since buying whole chickens is always a better price, consider cutting up your own to have your ch. breasts and better price, too! It’s actually very easy once you get the hang of it. We raise about 75 chickens for ourselves plus help several other families raise theirs here, too, so when butchering day comes, I spend as much time as I can spare cutting mine up so as to save freezer space. Lately I’ve been taking out whole frozen birds and defrosting till cutable – if there is such a word – then cutting up 6-9 of them, packing breasts together, legs and thighs together for the grill, and the carcasses go into a big pot for soup broth that I pressure can. I refreeze as the pieces haven’t really defrosted and my dogs eat the wings raw as well as all the skin pieces and nothing goes to waste. There’s probably a You tube video out there on how to cut a chicken up. I forget where I learned – maybe from a tutorial. Give it a try ! I didn’t see the recipe for the barbarian sauce. Could you send that to me. I would love to try it thank you very much.!!! Wondering what kind of muffins you served in the photo above? I believe it is a Honey Cinnamon Muffin: http://heavenlyhomemakers.com/whole-wheat-quick-mix-honey-cinnamon-muffins. My kids (mostly my 10 yr old son) are even excited to “eat healthy”! My 5 yr old daughter could care less..as long as she doesn’t have to eat green beans or water melon. Tonight I made your BBQ crockpot chicken, Italian roasted potatoes, and broccoli and cheese. MY KIDS LOVED IT! I think what I love most about your recipes, ideas, and advice is that nothing is overly complicated…and that is a sigh of relief!